Los Angeles has a lot of hidden treasures, but it's easy for me to forget or to take for granted all that is available. Unless something happens to make me realize that there actually are better ways to spend a free day than quilting and sewing indoors. 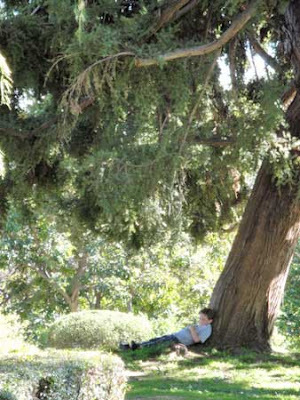 What better way to while away an afternoon than under a shady tree? Earlier this month, my cousin, friend, and I went to the Huntington Library in San Marino. I went because the Library had just received a Warhol as a gift and it was on display. And I thought my cousin who recently moved here from Korea and her friend, a native from mainland China who is here to learn English and teach Chinese, would both enjoy an outing and a day away from the office. 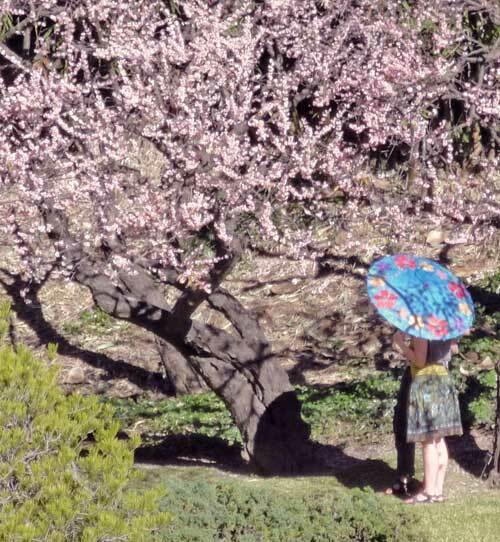 The vivid turquoise of the girl's umbrella caught my eye in the Japanese gardens. The Library is an incredibly beautiful place with so many gardens and world-class art to enjoy. Sometimes being rich can really be fun as Mr. Henry E. Huntington proved. The Library was originally his residential estate and he left a legacy to establish the Library to be enjoyed by the public and also serve as a major scholarly resource. 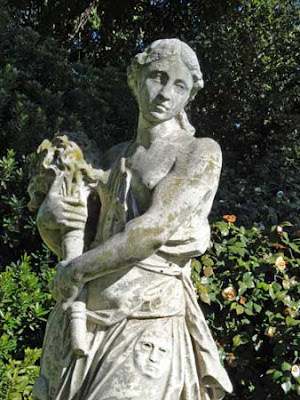 This is one of the statues that line what used to be the family's bowling lawn. The bowling lawn is bigger than most housing lots in Southern California. If you're ever in the area, I highly recommend taking the time for a visit. 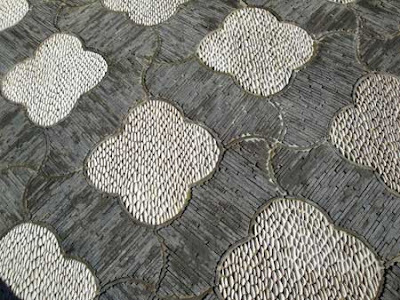 An occupational hazard of quilting is that I see potential quilt designs everywhere. These tile-like stones line one of the paths in the Chinese garden. I haven't been there for a long time, and used to go more often. I think it's time to make the trek again with some pencils, paper, and blanket! Looks great.